Aung San Suu Kyi has urged prospective voters not to be swayed by the ethnic and religious divisions that have plagued Arakan State. THANDWE, Arakan State — National League for Democracy (NLD) leader Aung San Suu Kyi has continued her campaign tour of southern Arakan, urging voters not to be swayed by the ethnic and religious divisions that have plagued the state. Following her appearance in Toungup the previous day, around 1,500 Thandwe residents attended Saturday’s rally, with locals attributingthe smaller crowd to confusion over a township edict. Authorities said they would charge any protesters who attempted to disrupt the rally, but locals reportedly believed the announcement was directed at members of the rally’s audience. After repeating Friday’s pitch for greater economic development, government accountability and employment opportunities, Suu Kyi was again asked whether a future NLD government would favour “Bengalis”, the term used by many Arakanese Buddhists and the Burmese government to describe the region’s stateless Rohingya Muslim minority. The opposition leader alluded to vague rumors that had spread in the township before her arrival, accusing her party of courting Muslim voters and violating the country’s election laws. Suu Kyi did not elaborate on the provenance of the rumors. When presented with a similar question on Friday, she asked the audience to think critically about the motives of individuals using ethnic and religious tensions during the election campaign. The crowd at Saturday’s rally in Thandwe. The NLD has concentrated its Arakan campaign in the south of the state, where it is expected to have a better chance of winning seats against the regionally dominant Arakan National Party. Ngan Chaung village resident Than Htwe, 60, said he would vote for the party after watching her stump speech on Saturday. Maung Nge, the head of the NLD’s Kin Thay Khun village office, told The Irrawaddy that tens of thousands of people supported the NLD in Thandwe, but the party faced a tough fight against the incumbent Union Solidarity and Development Party (USDP), whose candidates had promised to build new bridges, roads and schools. The USDP won Thandwe’s Lower House seat in 2010 with 45 percent of the vote, against a crowded field of rival ethnic parties. Suu Kyi will travel to Gwa Township in Arakan State’s far south on Sunday for her next campaign appearance. 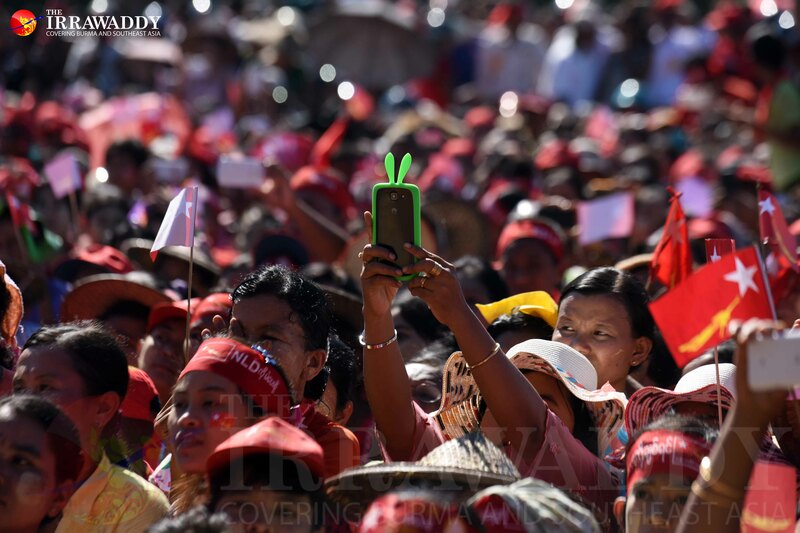 Top Photo - (JPaing / The Irrawaddy) National League for Democracy leader Aung San Suu Kyi addresses a party rally in Thandwe, Arakan State on Saturday.